On Jan. 31, 2018, Meredith Corp. announced that it had completed its acquisition of Time Inc., and that Feb. 1, 2018, would be the first day of operations for the combined company. At the time the deal closed, Meredith had approximately 4,000 employees and Time Inc. had roughly 7,200 employees. The deal instantly expanded Meredith’s digital traffic to sixth-busiest in the country, behind organizations such as Google, Microsoft and Apple. In March 2018, Meredith announced that it planned to sell Time magazine, Sports Illustrated, Fortune and Money. By November, Meredith had completed the sale of the Time media brand, and in December it finalized the sale of the Fortune media brand. The past year has been both exciting and challenging for Joe Ceryanec, as he and his financial team at Meredith Corp. integrate two complex media companies into one following the $2.8 billion acquisition of Time Inc. Going forward, Ceryanec will continue to play an instrumental role in the strategic planning for what is now the largest player among the top U.S. media companies. 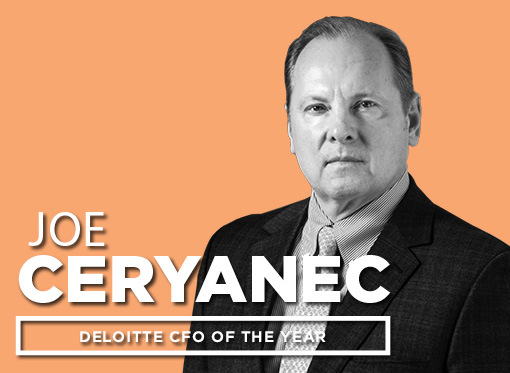 Ceryanec, chief financial officer of Des Moines-based Meredith Corp. for nearly a decade, has been selected by the Business Record as the Deloitte CFO of the Year. Before working for Meredith, Ceryanec spent 12 years with telecommunications company McLeodUSA in Cedar Rapids, where he held positions as corporate controller, treasurer, chief accounting officer and CFO. During his first five years with McLeodUSA in the late 1990s, the company ballooned from 400 employees to upwards of 11,500 at its peak in 2001. A certified public accountant, Ceryanec began his career working for public accounting firms KPMG and Ernst & Young. He earned his business degree in accounting from the University of Iowa. He currently serves on the board of trustees of the Des Moines Art Center and on the board of the Tippie College of Business. Although he and his wife, LeNae, lived in Cedar Rapids for 18 years and raised their daughter and two sons there, Ceryanec says that Des Moines now feels like home for both of them. They live in Glen Oaks and are looking forward to the arrival of their first grandchild in mid-February. In an interview, Ceryanec shared insights on his role as CFO, emerging trends he’s seeing in the media industry and the opportunities that he sees ahead for Meredith. What have been some of the challenges of integrating the companies? Part of the imperative of making the acquisition successful was reducing the cost structure. Time was very New York-centric. Most of their employees were in downtown Manhattan. So not only have we been integrating systems and processes, we’ve actually been eliminating functions out of New York and bringing those back to Des Moines. So we’ll probably have added about 200 to 300 people in Des Moines as part of this. A lot more than that will leave New York. At the same time we’re trying to bring everything together, we’re trying to tear pieces out and sell them. Has there been a lot of shifting of people in Des Moines with additional staff? There has. The good news is, we had enough room in our facility to accommodate the 200 to 300 people we’re adding. We did have to reconfigure some offices to make it more high-density. Filling that building does kind of add to the buzz. It’s allowed us to add a lot of younger people, which adds a whole energy to Des Moines. And we’ve been able to create some career paths for people because of the incremental functions we have here in town. What’s changed with your role? As part of the merger I picked up some additional functions, including IT and our production and procurement group. I also picked up about 1,000 employees in India. Time had a pretty big operation in India; we have reduced the size of that since the acquisition. I was actually in India in November. They really support a lot of different businesses — accounting and finance, IT, production — and they’re a big supporter of data analytics. There are two things that continue to be a focus. One is getting the processes, systems and people integrated such that we have better visibility into our forecasts and projections. We at Meredith historically have been very “buttoned up” and run a very tight organization. While going through this transaction and trying to strip out brands and integrate brands, right now our visibility into the details of the business just isn’t what we’re used to and it’s a little bit uncomfortable for our senior people right now. The other is, as part of the acquisition we took on a significant amount of debt. We’ve historically been very conservative in our leverage. We took on $3.2 billion of debt to fund the acquisition. Getting that debt paid down — our goal is to have $1 billion of that $3.2 billion paid down in fiscal year 2019, and we were approximately two-thirds of the way toward that goal halfway through the year. How do you see the role of CFO changing? Part of it is being a CFO of a public company, and now doing a large acquisition, there’s a lot more focus on making sure we achieve the objectives we’ve set, making sure we perform the imperatives that we set out. So it does add pressure on whether we’re hitting our marks. Number two, as a CPA and coming out of the public accounting world … it’s a very different dynamic today than when I was in public accounting 25 years ago. After Enron and WorldCom and all of those issues, the government created the Public Company Accounting Oversight Board. They’re really the auditor of the auditors, and it has really changed the dynamic of the relationship between the audit firm and the company. It’s made it more difficult for our accounting team than historically. What do you find most interesting about being a CFO in the publishing industry? Being the CFO, I’m involved in almost all aspects of the business — monthly meetings with the senior team, long-range strategy meetings. Thinking not only about how we’re getting this acquisition integrated, but what are we going to be doing next. I think the media industry is in some sense fun — we’re still somewhat New York-centric. What are some of the potential areas for further growth? Most people don’t think of Meredith this way, but we also own 17 TV stations, and that industry is going through a lot of change. In fact, there’s been quite a few mergers and acquisitions in that industry. … We’re always looking to add to the station portfolio as well. In the time I’ve been at Meredith we’ve added five stations. … Now that we’ve got this significantly scaled magazine business, what’s the longer-term view on broadcast? Do we merge or partner with someone, or do we think we’ll sell that business someday? It’s a constant internal discussion. growth business. So one of the big topics of our monthly strategic meetings is, where are those places, either organically or through acquisitions, that we can invest in to get that top line growing again? Is there a short list? You know, the digital world has always been [a consideration]. The trouble is that the so-called FANG stocks [Facebook, Amazon, Netflix and Google] are taking so much of the ad dollars in that industry. Even though we’re a top 10 digital player in the U.S., they’re taking so much of the ad dollars that we’re fighting for the remaining 20 or 30 percent of the business. Three years ago everybody would have said buy a digital business. We’re pretty glad we didn’t, because they’re competing for the same spaces we are. We do think there’s an opportunity to grow digital. Our belief is that there will continue to be a demand for print magazines. We hear that all the time, that women don’t want to read magazines on their tablet — they like the print format. Another area we’re focused on: How do we generate more revenue from our relationships with consumers? We have 45 million monthly subscribers to our magazines. In total we interact with 175 million unduplicated consumers every month through both the digital and the print. So how do we enhance that and draw more wallet-share out of that relationship? Your thoughts on Steve Lacy announcing his retirement? That’s going to be a bit of a change. Steve hired me 10 years ago, and we’ve worked very closely together. A year ago he went to executive chairman and Tom Harty became CEO, so we’ve been in a period of transition. But anytime somebody who’s been with the company so long leaves, it’s a big change. He’s been a great mentor and a friend. Do you see CEO as a possible path? I think with Tom stepping into the CEO role, I don’t see that as my path. This is probably my last “career” job. What I look forward to over maybe the next five or six years as I think about retiring is to be involved on some for-profit boards, maybe getting involved in investing in some companies and being involved on boards, maybe get involved with a private equity firm.